From excavators and material handlers to dozers and forest machines, hydraulic components drive many Cat® machines. To deliver power, performance and efficiency on a day-to-day basis, they require routine service to stay working their best. Practicing preventive hydraulic services can extend the life of your equipment while lowering long-term ownership and operating costs. Gregory Poole recognizes the importance of quality, professional hydraulic repairs for the construction, mining and other heavy industries. We spent time and money developing our capacity to repair, reseal and reconstruct hydraulic components. From the skills and experience of our mechanics and technicians to the quality of our technologies and facility, we’re the one-stop shop for servicing Cat hydraulic cylinders, pumps and motors. Serving an area encompassing the eastern portion of North Carolina, we are committed to offering value and excellence in everything we do. Contact us today for all of your hydraulic repair needs, for all makes and models of heavy equipment. After more than 65 years in the heavy equipment industry, we know different clients have different service needs. When it comes to any repair or maintenance issue, you require a partner who can work with you to develop cost-effective solutions that enhance your long-term performance. Whether you need to replace Cat hydraulic pumps or an emergency hydraulic system repair, we offer a fast response and reliable services to keep your equipment operating at peak performance. Hydraulic repair services on all makes and models of heavy equipment. As a Cat dealer, we offer exclusive service and sophisticated diagnostic tools for repairing and maintaining any of the company’s machines. We are also uniquely qualified to service equipment by other brands. Contact our hydraulic team for more information. Quick turnaround times, with teams working in two shifts to get the job done faster. We know how important it is to minimize downtime when repairing critical hydraulic components, which is why we offer some of the fastest service possible. A full range of hydraulic services for components of all sizes, including complete cylinder resealing, complete cylinder fabrication, rod reconstruction, barrel reconstruction, pump and motor reconditioning, and more. Full machine shop capabilities, for fabricating or repairing specialty hydraulic parts and other components. As a leading source for hydraulic system repairs and maintenance, we offer a broad selection of services. 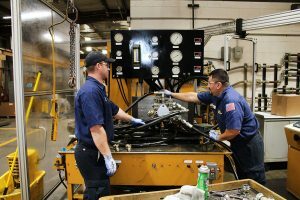 Pumps and Motors: From service and repairs to rebuilding and power lapping, our factory-trained technicians are experts at working on hydraulic pumps and motors. We also offer piece parts and exchange programs. All components are bench-tested to factory standards. Rods and Cylinders: Whether you need a complete cylinder reseal, honing or re-chroming, you’ve come to the right place. Additional services include barrel and cylinder rod fabricating and rod and barrel eye repair. We keep all different sizes of rod stock in our inventory, and all cylinders are pressure-tested to withstand your most robust applications. Hose and Fittings: Our hydraulic hose services are performed while you wait, for both Cat and Allied brand components. You benefit from top-quality hose products, Certified Clean Assembled by highly-trained technicians. Hydraulic Rebuilds: We’re able to refurbish or rebuild Cat hydraulic cylinders, motors and other critical parts and systems to breathe new life into your aging machines. The best parts are only as good as the technicians that use them. At Gregory Poole, the knowledge, skill, and experience of our technicians are vital to our success. We are committed to harnessing the power of one of the most experienced, best-trained staff in the industry to drive results for our clients. 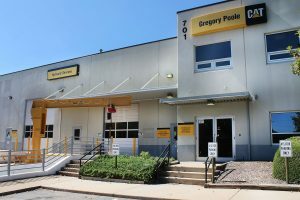 In short, when you choose Gregory Poole as your service partner, you get access to experts who know more about your equipment than anyone else. Contact our office today to find out more about what we can do for you or request a quote for any hydraulic repair or related service.